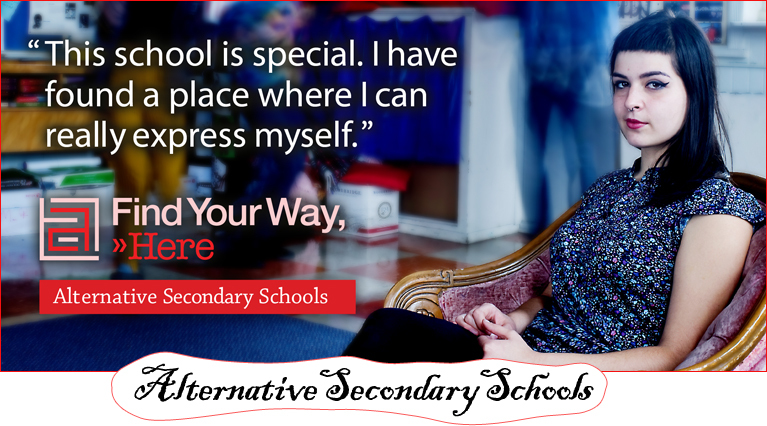 The TDSB offers 22 alternative schools at the secondary level. Each school is a close-knit, highly engaged, diverse community that offers a fresh and unique approach to learning. Alternative schools are places where students find their way through learning environments that vary widely and often include self-directed projects, experiential learning, business and entrepreneurial mentorship programs, strong co-op programs and credit recovery opportunities - all while earning OSSD credits. Here you may find extraordinary art and word galleries, classrooms with comfy couches, and teachers mentoring their students. These are schools where students need a new way - to find their way. And they do. Come experience an alternative secondary school.